PORTOBELO, PANAMA: About an hour and twenty minutes of drive from Panama City is Portobelo, in the Caribbean coastal area known as “Costa Arriba”. 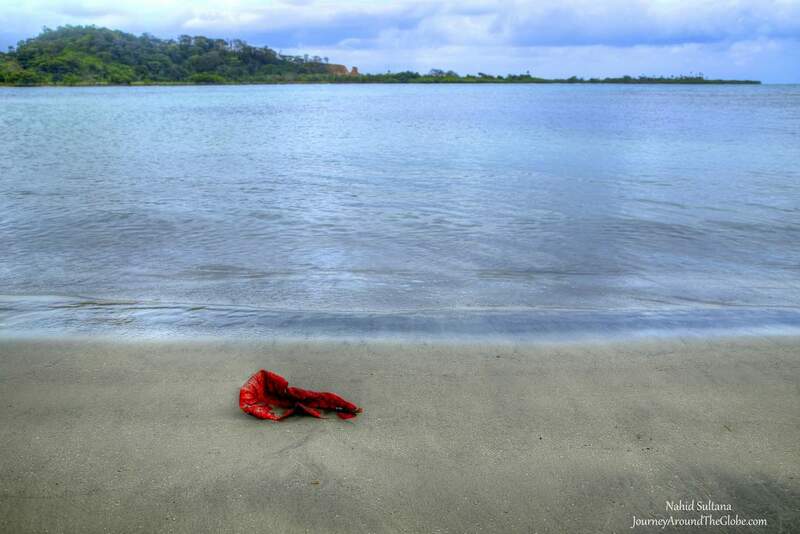 Historically, Portobelo was Spaniards’ richest treasure port and a fishing village. Now, let’s just say it can be a nice getaway from the chaos of big cities. We started our tour at 9am and took about 8 hours all together. We visited few other places before and after Portobello. 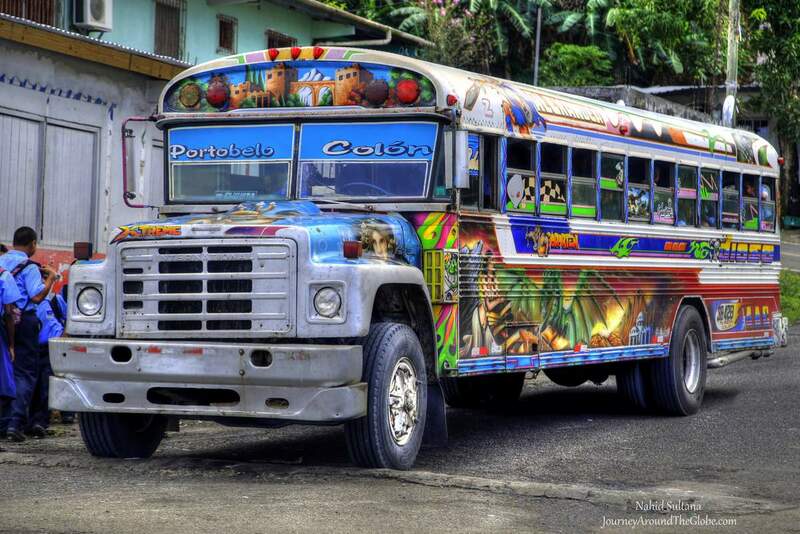 Our original plan was to go to both Portobelo and Colon. Therefore the fee was $200, but we couldn’t manage to go to Colon for shortage of time. 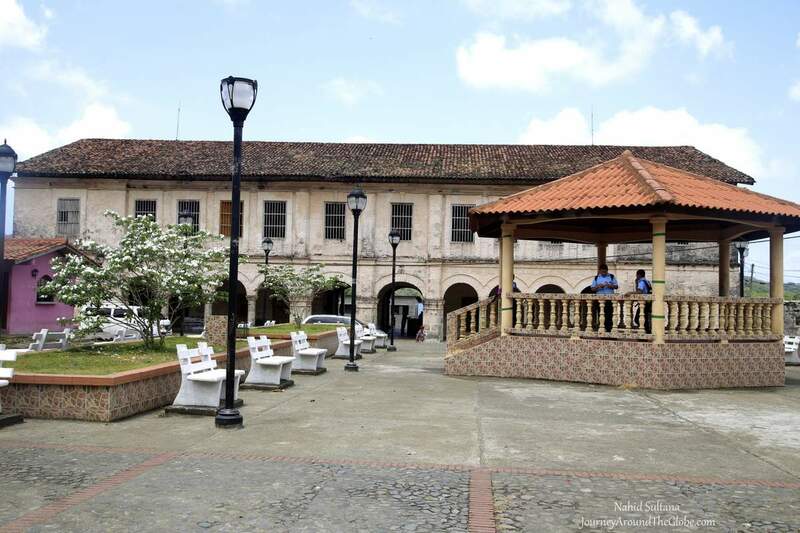 Colon is another historic town of Panama, about 45 minutes’ drive from Portobelo, where new expansion of Panama Canal is taking place. 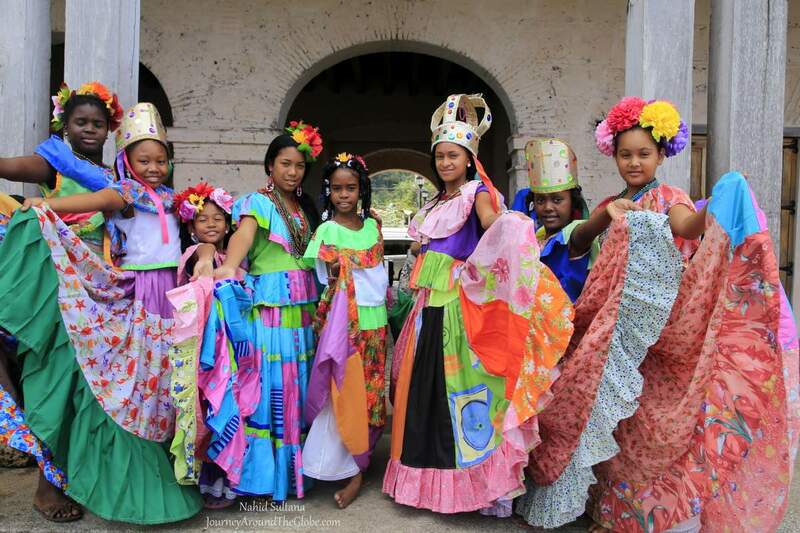 TIME of TRAVEL: We took this trip to Portobelo on our second day in Panama. First day we roamed around the capital with the same taxi driver exploring the history, culture, and city life of this place. Before Panama, we were in El Salvador. Our next destination was Costa Rica and Nicaragua from here. This was our first trip to Central America which we took in the mid-March of 2015. We got to see a lot in this two weeks of vacation. OUR HOTEL: Our hotel, Hyatt Place Panama, was in downtown Panama City. Apart from having a roof-top swimming pool and a fantastic view of the city from the room, the hotel was nicely located in the heart of the capital. Portobello was about an hour and half drive from here. The taxi we hired for this trip was arranged from this hotel. EATING and SHOPPING: Many of the restaurants were closed or shut down in Portobelo. There were some street side places which our driver didn’t recommend us for hygienic reasons. He took us to a nice but not-too-fancy place, called “El Palenque” near Santiago Battery. It’s not a huge restaurant that can hold many people nor did it have a long list menu for its guests. But they had some good quality dishes with some fusions. We sat outside by the water and only two other tables were occupied. I had to get some fresh juice, like papaya, watermelon, and pineapple. We ordered some rice with shrimp, rice with prawns, and salad. They were cooked somewhat in combination of Central American and Caribbean style. 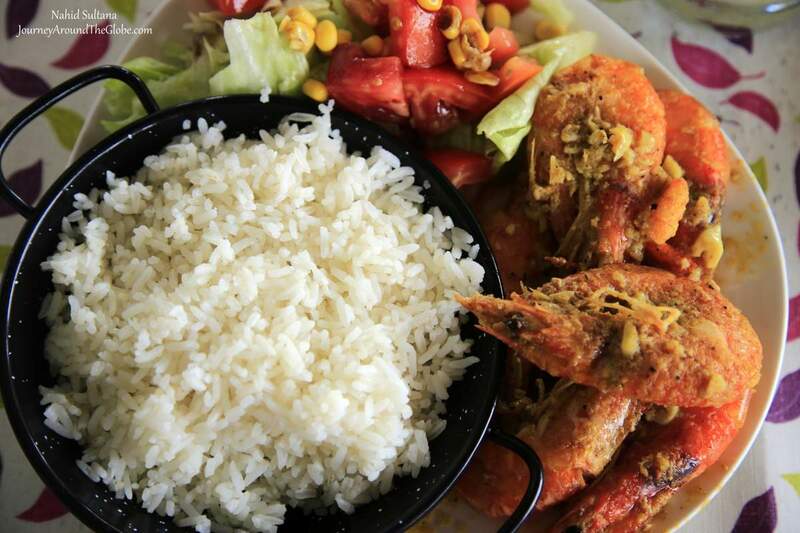 The rice was cooked in fresh coconut water and shrimps/prawns were perfectly cooked with perfect seasonings. Portobelo is not an ideal place for fancy shopping or hunting for souvenirs, actually we barely saw even souvenir stores here. There were some vendors with carts outside the Iglesia de San Felipe selling generic jewelries and small trinkets, but didn’t really find anything unique that caught my eyes. PLACES WE’VE VISITED: As I mentioned above, this trip was about eight hours long and we couldn’t visit Colon, which was originally part of our plan. These are some of the places we’ve visited in and around Portobelo. 1) PLAYA la ANGOSTA: Playa la Angosta kind of popped up in front of us on our way to Portobelo and thanks to our driver that he noticed and took us there. This is a beautiful beach in the Caribbean coastal area of Costa Arriba and with all the coconut trees, it may give you a feeling of Caribbean beaches in some way. It was not crowded with loads of people, just some families scattered around. We had only half an hour here and while my girls were playing with the sand and water, I took a short walk around the white sandy beach to take some pictures. You can spend hours here just sitting under one of the straw-hut tables and enjoy the fresh sea-breeze while drinking some coconut water. It is a private beach, visitors just have to pay $3 for parking. 2) PORTOBELO: From Panama City to Portobelo was a fantastic scenic ride. We had blue Atlantic on the left and green rainforest on the right. Striking natural beauty were everywhere. After half an hour drive from Playa la Angosta, we were in Portobelo. When stepping outside the van near Plaza Mayor, I felt like the town was frozen in time. Its endearing small-town characteristics instantly captured my mind. 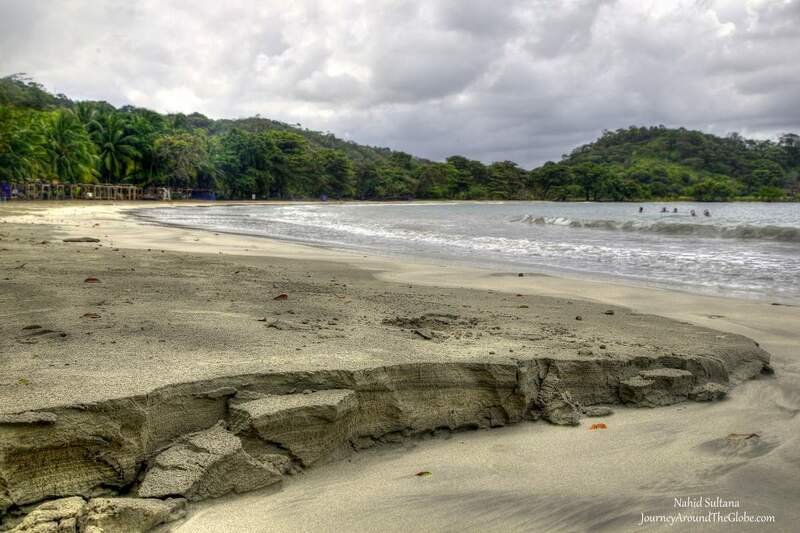 Portobelo is a town with population of roughly 5,000 and about 500 years old. This was the first town in the Atlantic side and Spaniards built this town as a port. 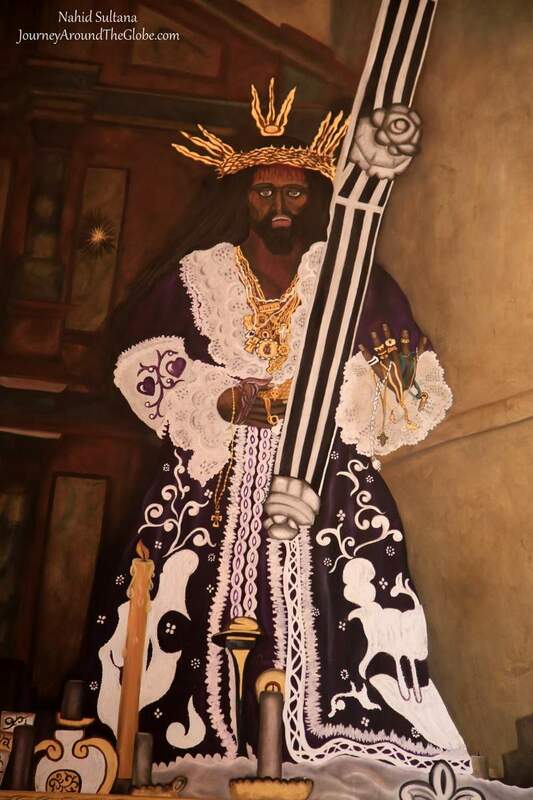 It is well-known for its century old tradition of Black Christ celebration, which is still held every year in October in the ancient Portobelo Cathedral. We entered Jesus Nazareno Church or Iglesia de San Felipe that dates back to the 1700s. Bold façade and its paintings of Black Christ make this church a unique place to visit. From the church, walked thru some narrow alleys and empty neighborhoods and came to Fuerte San Jeronimo. 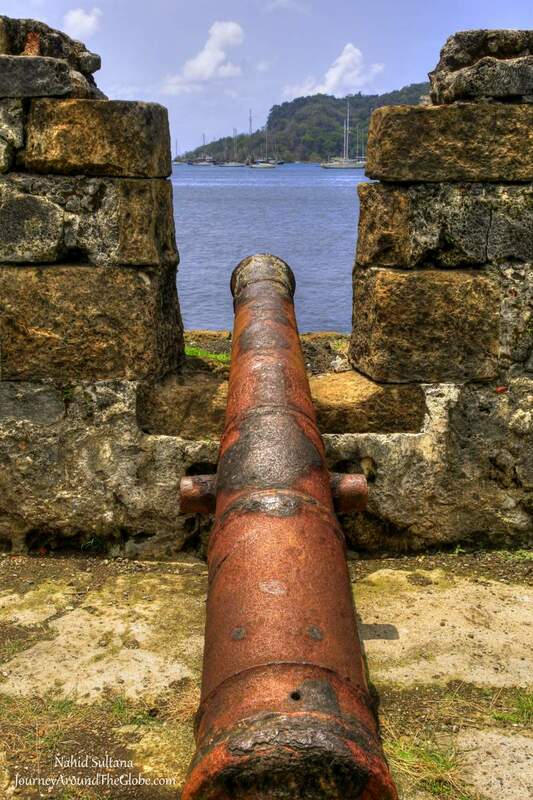 In Portobelo, the fortresses of San Fernando, San Jeronimo, and the Santiago battery are part of the defense system. The structures lost their medieval-like features and adopted a more streamlined neoclassical style. Few centuries old San Jeronimo Fort sits by the Atlantic and only ruins are left in this fort complex now. It is believed it was built somewhere around 1758. Other than the history, just enjoy the blue water and the old ground of a fortress. Few minutes of walk from the Fort San Jeronimo, is the Santiago Battery. The battery was planned in 1753 and only the skeletons and ruins stand by the calm water of Atlantic. 3) GATUN LAKE: In the late afternoon, after the lunch, we left Portobelo. Since Colon was canceled, the driver took us to show Gatun Lake from a highway. 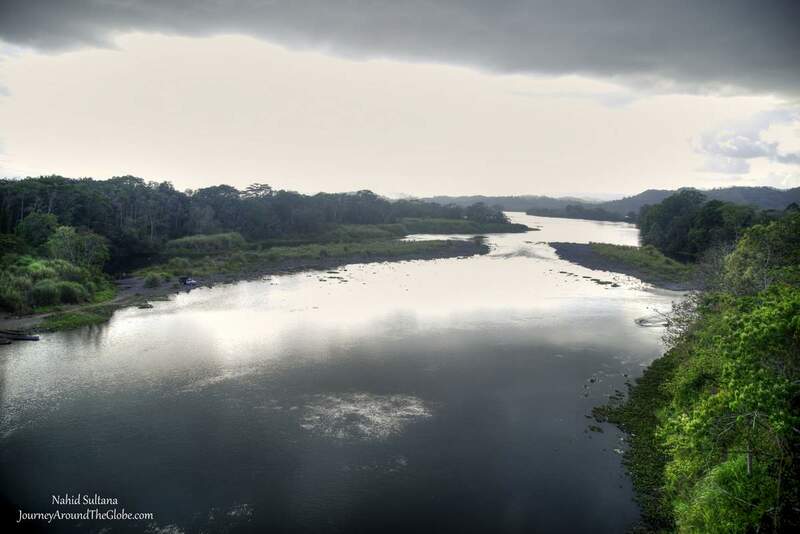 It is a large, long, and artificial lake that constitutes with the whole Panama Canal system. We didn’t go down to the lake, just stood on a bridge and looked over this lake surrounded by rainforest right around the sunset. 4) PEDRO MIGUEL LOCK: After crossing a narrow highway thru Soberenia National Forest, we arrived at Pedro Miguel Lock. Along the route of the canal. There are 3 sets of locks and Pedro Miguel is one of them. We visited the Miraflores Lock the previous day and now we were in front of Pedro Miguel Lock. 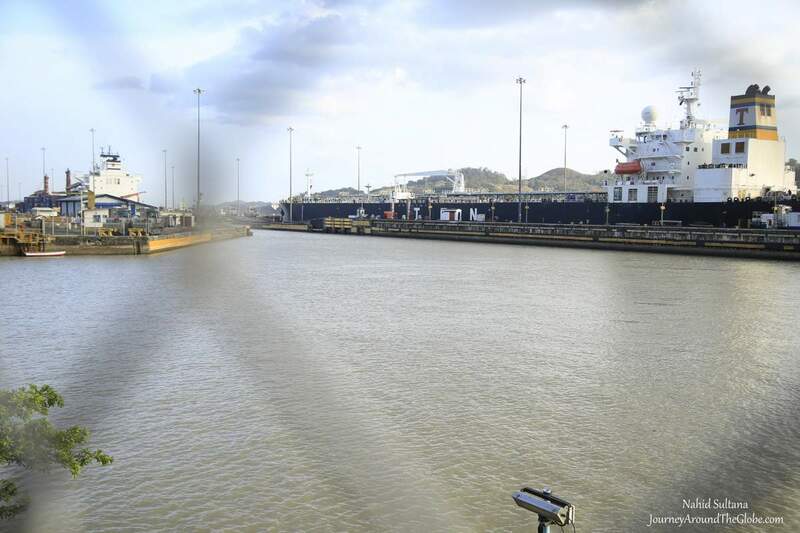 The smallest set of locks are at Pedro Miguel Lock. Standing on the other side of the fence on a highway, we watched a big vessel slowly crossing the lock to the other side.